What Does My Electricity Usage Look Like? Have you ever wondered where your power is going or why your electric bill is bigger than you expected, even after you have installed a solar electric system? 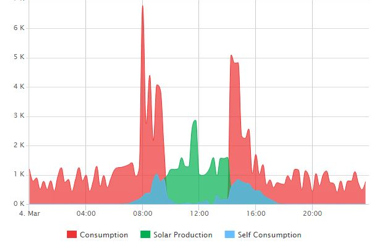 Consumption monitoring offers an at-a-glance visual glimpse into your electric usage. Nearly all solar electric systems today are equipped with system production monitoring, which allow customers to track the daily and lifetime electricity production of the system from either a mobile app or a computer. With solar monitoring alone you’re able to see what the solar system is generating but it doesn’t give you the whole picture. With the addition of consumption monitoring, the chart in Figure 1 above shows the solar generation in blue and green. The blue shows the proportion of solar electricity you are generating that your home is consuming, referred to as “self consumption”. The green is showing the excess solar you’re generating, above and beyond what you’re using. That’s electricity you are sending back to the grid for credits. The red shows what you’re consuming during times when the electric usage exceeds the solar power generation. So with consumption metering added to your monitoring system you’re able to see the complete picture. Brad Stewart, with All Phase Comfort, recently purchased a solar electric system from us along with a new very efficient Fujitsu heat pump. He wanted to see not only what his new solar electric system is doing but also wanted to track his electrical usage. In Figure 1, the graph clearly shows the heat pump cycling on and off. Notice the small 1k plus power peaks occurring at regular intervals in the early morning while everyone is asleep. Then starting at 8am the big red spikes are the dishwasher and the electric dryer. However, as the blue self-consumption curve rises (power consumed that is produced by his solar electric array) the red spikes go down in wattage as more of that load is offset by the solar electric system. The green curve around mid-day shows that almost all the solar production is being sold to the grid for credit. Then at about 2pm the electric dryer is on again. If you would like to be able to track electricity consumption relative to your system production, consumption meters are the answer. These meters provide valuable insight into electricity usage patterns and energy efficiency of your residence that can be applied to energy saving strategies and monetary savings.